My Favourite Productivity Tool | Oh, I Juggle! i have set the timer and then started typing my comment. could so, so identify with your post. i am a total timer fanatic. curious whether you face the same problems as i do though. people around me get puzzled, amused, and irritated more than they get impressed at my productivity tool. the other thing is that in spite of doing this, i still end up thinking there are more efficient ways to do what i am doing – with the timer. there goes my timer. enjoyed reading. 🙂 I tried writing the post with the timer on. Too many interruptions from my son, though. My daughter is impressed with the timer. We sometimes pretend it is like Masterchef and use sentences like, “Your time starts now!” and “Step away from the table.” etc. The work done speaks for itself too. I use a whole arsenal of tools. I get bored with one and look for new motivators. I am not a natural, you see. inbox – work towards zero items in inbox, at least by friday afternoon, use emails to yourself as a task list, put the task in the subject line, integrate with shared google calendars – office, family, friends, – to send automated alerts for events and appointments. there is a whole school of thought that does not think this is a clever way of doing things, but it works for me. i email myself links to read, things to do, this way, i can attend to things without forgetting the stray thought that crosses your mind or browser. call list – edit so that only calls that need to be made remain in your call list, use down times and waiting times to catch up on calls, and once done, take it off the call list. the notes feature on the phone can also serve as a task list, if your email is not on your phone. these two along with my trusted pen and paper for notetaking are pretty much all the productivity tools that i use. almost everything that is in my personal productivity kit is learned from david allen’s getting things done, and tweaked to suit my needs. Will let you know how this goes…sounds really nice! Hadn’t I mentioned it earlier? Glad you like the idea. Very interesting post. Will need to use timer and see how my chaotic morning schedule goes. I find the idea of dividing a task into smaller chunks very innovative. I sometimes sacrifice my morning cup of coffee because one task took too much time to complete and I have to rush. If your ideas can ensure me a coffee, what better way to start off the morning. Thank you for sharing this post. Thanks for the kind words, Secretlakr! I can hardly take credit for the idea of dividing a formidable task into bite size chunks. Time management gurus keep telling us that. I first read about it in Brian Tracy’s ‘Eat That Frog’ where he asks us to “slice and dice the task”. 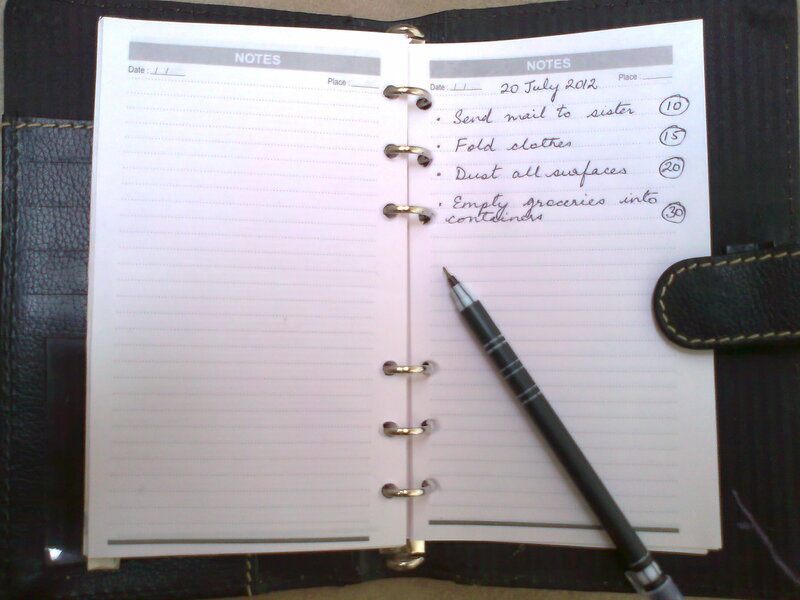 Another great idea is to plan every day in advance, on paper. I write down my ‘to dos’ for the day the night before. It frees your mind for a good night’s sleep and you can begin your day with greater clarity. You will love the book. Try and get a copy. Aha! 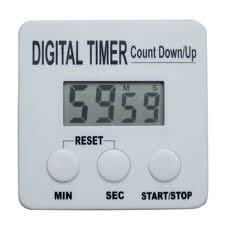 Never realised that we could use a timer for Day-to-day work. I must give it a try. An interesting post indeed..I love the pic of your journal. The look of the journal was orchestrated. I dug up an old planner and made up a list just to show how it might look. My real diary is quite ragged and lists are long with scribblings in the margins. Certainly not photogenic. I love this post! I make lists and like subho I also send myself emails! but I rarely set timers for them especially for short bursts of time! I really do love the idea of setting times for getting home chores done! I am totally incorporating this in my routine! Thanks Juggler! And so glad you read my blog and I can prancing here! Pingback: Five Great Ways to Trick Yourself into Feeling Motivated « Oh, I Juggle! Pingback: Freewriting Your Way Out of Writer’s Block « Oh, I Juggle!